In 2016 I worked as a writer for Measure 98 (then IP 65 -- to increase Oregon's high school graduation rates) and then as Communications Director for the Yes for PSU ballot measure campaign to raise money for scholarships and teachers at Portland State University. Here is a selection of communications materials I created for those campaigns. Yes for PSU op-ed by Stoel Rives attorney (and Republican) Jim Westwood. 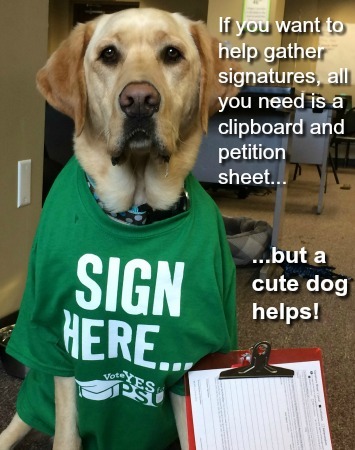 I designed this post card using my dog, Buddy, as we worked to recruit volunteers to help gather petition signatures. Here are a couple press releases I wrote for the Yes for PSU campaign. Yes for PSU Twitter feed that I managed and populated. PSU alumni back Yes for PSU. A life-long educator lends his support for the Yes for PSU ballot measure. This one-pager (front and back) gives an overall description and feel of the Yes for PSU campaign's goals. This piece was created and updated in collaboration with Winning Mark consultants. This report shows examples of academic success using programs like those proposed in IP65 in the comparable states of North Carolina and Kentucky. This write-up shows where IP65-like ideas had been implemented with great success in select areas of Oregon. This is a one-pager (front and back) that I designed and edited for Measure 98, which was then still called Initiative Petition 65.